The International Board of Certified Athletic Therapists (IBCAT), based in Canada, is an international not-for-profit, self governing, and professional association; with members worldwide, that promotes the highest standards of ethics and client & patient care in athletic therapy, contributing to the health and well-being of millions of athletic therapy clients & patients. On behalf of its members, IBCAT lobbies for pro-athletic therapy legislation and policies, promotes a positive public image of athletic therapy, supports research, protects the public, and offers leadership for the advancement of the athletic therapy profession. IBCAT issues certificates of registration & license numbers to athletic therapists who are graduated from accredited athletic therapy schools, colleges & universities and who have successfully passed athletic therapy board exams. IBCAT members are permitted to practice athletic therapy worldwide, including the USA, Canada, UK & Australia, and to bill insurers when applicable. 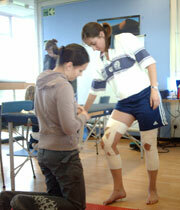 Athletic therapists registered with IBCAT adhere to the code of ethics and professional guidelines set up by IBCAT.